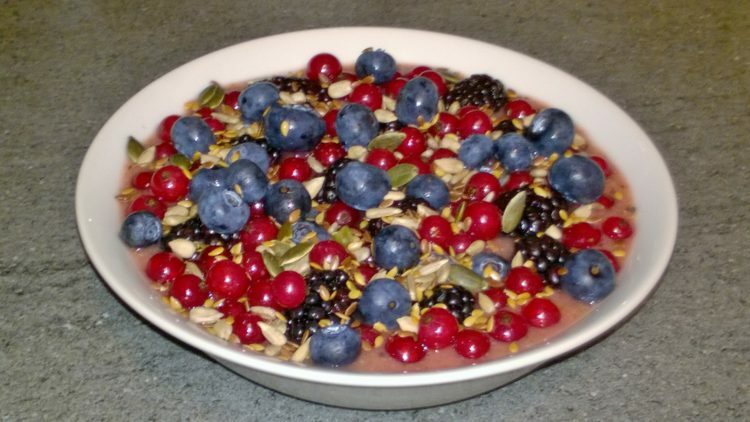 This delicious Berry Smoothie Bowl packed of vitamins and minerals is the perfect way to start your day. 1 Put the pineapple, kiwi fruit, pear, strawberries, raspberries, coconut water, ginger and milled flaxseed into a smoothie/blender jug and whiz for 15 seconds until it becomes smooth thick juice. 2 Then pour it into bowls. 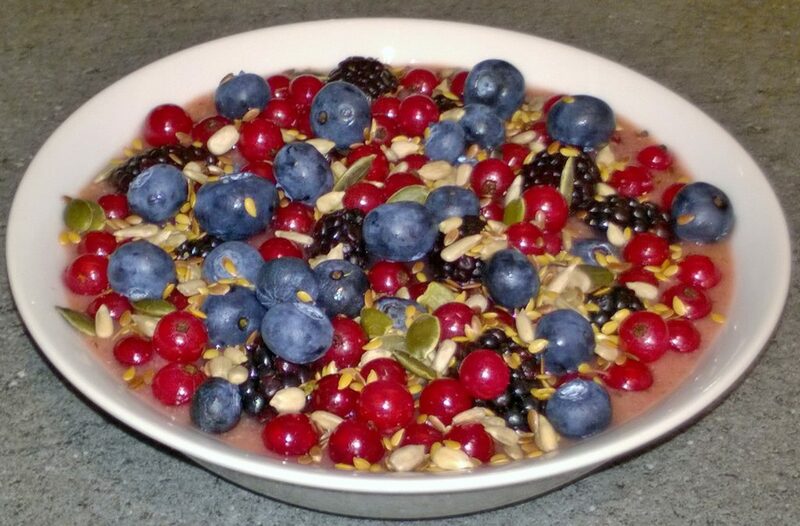 3 Top with the blackberries, blueberries and red currents, then sprinkle the mixed seeds all over. Pears are very low in calories, boost energy, helps lower cholesterol and body weight. They are great for keeping away wrinkles, promotes clear smooth skin and keeps your hair shiny and healthy looking. It is rich in dietary fibre which can protect you against colon cancer, it also contains vitamin-C, vitamin-A, calcium, copper, iron, potassium, manganese and magnesium. Kiwi fruit decreases the risk of heart disease and cancers, reduces constipation and improves protein digestion. It contains fibre, vitamin-C vitamin K-1, vitamin-E, potassium, copper and vitamin-B9.